Edward R. Andrews Elementary School is located in the Morrisville-Eaton Central School District. It is a rural school, consisting of 330 students enrolled between prekindergarten and fifth grade. The school defines its makerspace as “a place to create, innovate, experiment, design, and explore various aspects of the world around us.” It has been both exciting and rewarding to experience students becoming leaders in their own learning. Makerspace activities are incorporated into library classes, which align to classroom instruction. Students in kindergarten were engineers and created a safe place for the Three Little Pigs. Second graders designed trees using straws and connectors after reading the book Wishtree, by Katherine Applegate. They also became chemists as they explored the states of matter and were able to make slime to demonstrate their understanding. Fifth graders, thanks to a donation from Donors Choose, have access to a 3D printer and are currently using the program Tinkercad as a design tool. In October, our school started a Makerspace Club. Students in third and fourth grade were invited to our library after school to participate in hands’ on activities. One of the many lessons students learn in our makerspace is the importance of having a growth mindset. Students designed catapults and Marble Runs that allowed them to see that, sometimes, they will not be successful the first time they try something. It is crucial for our students to know that it is okay to fail, and still persevere. Sometimes, it is not an easy lesson to learn, but the mistakes that we make help us become better learners. Above, left: Makerspace Club coding and collaborating with Ozobots. Above, right: A kindergarten student testing out his KEVA plank house for the Three Little Pigs. Left: Fourth graders using KEVA Planks to make the tallest and widest structure. Below, left: Makerspace Club students testing out their Marble Run. We were also able to “make” a difference in our makerspace. Students used recycled materials to make holiday cards for people in our community. Students also designed “Adopt Me” bandanas that we are going to donate to local animal shelters in hopes that the dogs there will find their forever home. Our makerspace also uses materials from our local BOCES School Library System. Students used KEVA planks to engineer the tallest and widest structure they could. It seemed like an effortless task until students found out that only one KEVA plank was allowed to touch the table. There were many crashes and tumbles that day, but once again, our students learned the value of having a mindset focused on growth. Technology is also integrated into our makerspace. Students used the program BLOXELS on the iPads to create their own video games. Students were asked to program a video game based upon a book they had read recently, their favorite story, or a well-known tale. It warmed my heart when a few students chose stories that we had read as part of a library class. Students have also been introduced to coding using Ozobots. These tiny robots provide students with the fundamentals of coding. Students are allowed to use their own imagination and creativity to code the robots to enact various methods of directionality and speed. Our makerspace is new, and we still have much to learn; but the great thing about it is that as a community, we are learning together. 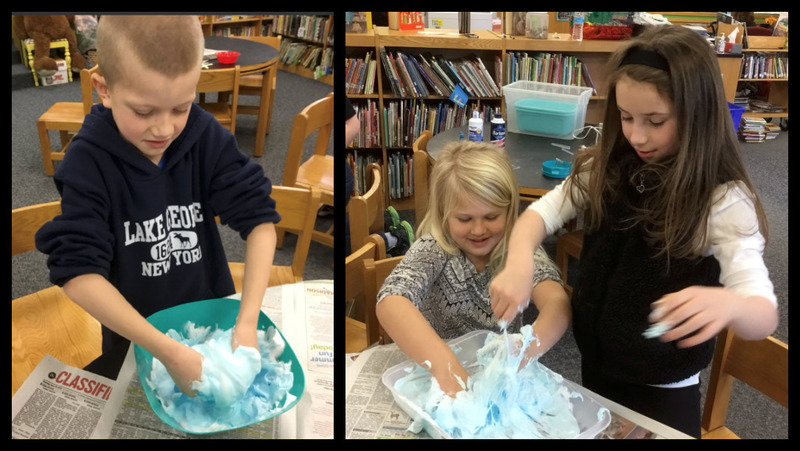 Second graders making slime after studying states of matter.